The General Court of the European Union has annulled antidumping measures imposed three years ago on Argentine and Indonesian biodiesel imports. The court made its ruling Sept. 15 in five separate judgements addressing cases brought by six companies. Seaboard Foods subsidiary High Plains Bioenergy has acquired the former Blue Sun Biodiesel plant in St. Joseph, Missouri. The facility has been renamed HPB-St. Joe Biodiesel and will produce 28 MMgy when running at full capacity. Wally Tyner, a professor at Purdue University, presented his research team's latest findings regarding GHG emissions of producing biodiesel from soybeans, which show land use change emissions could be up to 70 percent lower than what CARB adopted. After a lengthy retrofit project, Flint Hills Resources and Benefuel Inc. announced Sept. 13 the startup of the 50 MMgy Duonix Beatrice biodiesel plant and the first successful commercial-scale application of Benefuel's innovative Ensel technology. Renewable Energy Group Inc. announced Sept. 13 it sold more than 50 million gallons of biomass-based diesel last month, a first in the company's history. REG has 12 active biorefineries across the U.S. and an expansive distribution network. Argent Energy, one of the U.K.’s leading suppliers of sustainable biodiesel, has won two awards at the Low Carbon Vehicle Partnership's Low Carbon Champions Awards 2016: the Low Carbon Fuel Initiative of the Year Award and the Grand Prix Award. The European Commission recently reaccredited RSB's EU Renewable Energy Directive sustainability program. The re-recognition came just weeks after the EU Court of Auditors said the EU certification system for sustainability is not fully reliable. JetBlue announced a 10-year renewable jet fuel purchase agreement with SG Preston, a bioenergy company, Sept. 19. This marks one of the largest renewable jet fuel purchase agreements in aviation history. KLM signed a three-year contract for a supply of sustainable biofuel in Los Angeles. The fuel is produced by the local biorefinery AltAir Fuels and supplied by SkyNRG. LAX is the world's second airport to incorporate biofuel into regular refueling. California Gov. Jerry Brown signed two major climate bills into law Sept. 8, SB 32 and AB 197. The new laws require the state to cut emissions at least 40 percent below 1990 levels by 2030 and invest in communities hardest hit by climate change. 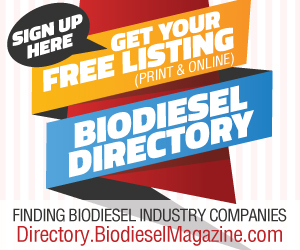 The German government reported that biodiesel demand for blending amounted to 61 million gallons in June, the largest monthly quantity in more than a year. The total biodiesel volume blended in the first half of 2016 was 330.2 million gallons. A new Iowa Biodiesel Board chair was elected Sept. 14 during the organization's annual meeting. Tom Brooks, general manager of Western Dubuque Biodiesel in Farley, Iowa, will lead the IBB for the next year up to a three-year term. Neste plans to sell 100 percent renewable diesel at select stations in Finland come January. The company says the product launch is one way it plans to participate in the centennial celebration of Finland's independence from Russia in 1917.